Oscar De La Hoya tells TMZ he accepts Floyd Mayweather's apology -- after Mayweather's team posted an Instagram pic mocking Oscar's substance abuse problems. Oscar -- who recently checked himself into rehab after falling off the wagon -- was out with a group in L.A. yesterday for a coffee run at a Starbucks and appeared to be in good spirits. On his way out, we asked Oscar about Floyd's Instagram apology -- and the Golden Boy told us, "It was very nice of him. I greatly appreciated it ... so, thank you." 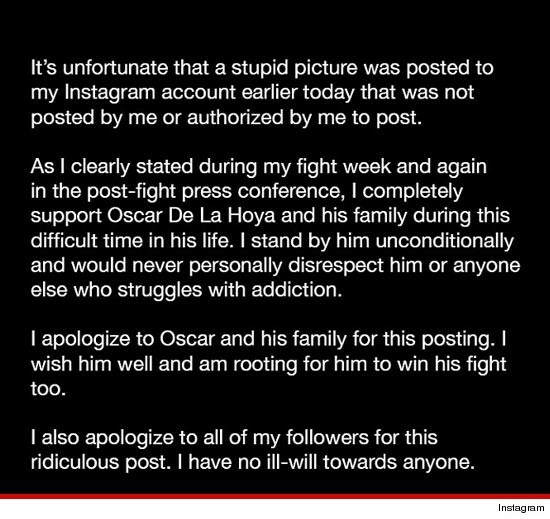 As we previously reported, Mayweather claims he never authorized anyone to publish the original Instagram image -- and insisted he would "never personally disrespect [Oscar] or anyone else who struggles with addiction."